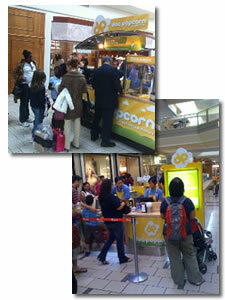 Doc Popcorn is the first business of its kind to bring a fresh- popped all-natural popcorn in a variety of flavors to a stadium/arena/shopping mall environment. A simple, flexible and controllable model empowers you to live the life you want! Whether you want to own just one location or build an empire, Doc Popcorn has several business models from which to choose and to grow. Our reason for being is to create smiles by bringing a healthy delicious all-natural snack to the planet, all while empowering those who wish to own their own successful business. The U.S. continues to be the world's largest popcorn consumer. Everyday Americans consume 17 billion quarts of popped popcorn. The average American eats about 54 quarts. (That's enough to fill the Empire State Building about 18 times! The natural food industry has seen tremendous sales volume growth in the past 8-10 years. Whether their reasons are for safety, environment or flavor, Americans are ready to eat better-for-you, natural delicious snack alternatives. Popcorn is considered a whole grain....that not only serves as a good source of fiber, but also contains the antioxidant Polyphenol, an important antioxidant in fighting heart disease, Alzheimers, and some cancers. ABC News Medical Unit, August 19, 2009. 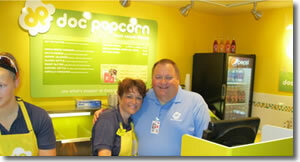 Are you ready to learn more about how being awarded a Doc Popcorn franchise can make you smile? Then we invite you to join us in a mutual investigation to learn about each other and see if we should POP together! Interested parties should have at least $60K to invest. 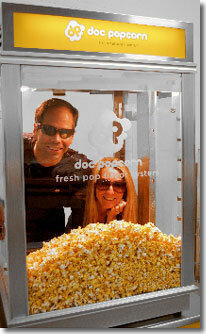 Click on Request Information button above for FREE information on how to start a Doc Popcorn franchise today! Please Note: Doc Popcorn opportunities for sale, and other franchise opportunities, business opportunities, businesses and franchises for sale on this web site are not to be considered as an "offering", "franchise offering", suggestion or recommendation by GlobalBX. The franchises, businesses and business brokers seen on this web site submit their own individual content. This advertisement depends entirely on the truthfulness of the information provided by our advertisers which includes, but is not limited to, franchisers, franchises, franchise brokers, franchise consultants, business sellers and business brokers. As always, GlobalBX recommends that you consult a lawyer, financial consultant, accountant or professional advisor before buying a franchise or business opportunity or any type of business. By submitting this form and requesting more information, you have agreed to all terms and policies of GlobalBX and the business and franchise offerings listed here. Please review our Terms & Conditions for more information.